In all this talk of hosts and servers and all the tools available to help businesses run on the web, it can be easy to forget that your host is a business, too. InMotion, SiteGround — they’re both providing products and services to their customers, and they need a means to easily manage customer billing, invoicing, payments, and mission-critical business information. Here, we cover the top panels for billing and hosting automation in 2019 — discussing operating system support, software integration options, reporting stats, client management tools, and more. See a breakdown of basic and premium panel features below, or skip to the panels comparison. Having a powerful, easy-to-navigate portal for keeping your business organized is a highly valued business expense, so getting it for free is awesome; however, if you’re running a multi-facted, profitable and/or growing business in the hosting industry, it’s worth considering a premium panel. Perhaps the most worthwhile feature of a premium panel from a reputed provider is the peace of mind that comes from knowing your business expenses, revenue data, and client information are kept safe, secure, and in pristine order. The following panels have been discontinued as of 2016: HostVice, ShinelSP, AWBS, WHMBILL, TheHostingTool, WHM AutoPilot, and AgileBill. Web Host Manager Complete Solution, colloquially known in the industry as WHMCS, is open-source and well-documented. With module development kits, local and remote APIs, and a number of compatible third-party application integrations, this platform is known for its extendibility and flexibility. WHMCS is hands-down the hosting industry’s most popular panel for billing management and hosting automation. Billing options include invoice generation, tax support, credit card processing, and your choice of free offers, 1-time bills, and recurring bills. The templated client area features many third-party templates, 10 language translations available, and extensive reports, which can be exported and printed in various formats. For hosts, cloud vendors, domain registrars, and other hosting industry businesses, WHMCS is market-leading. It came as no surprise to us that developer-friendly Blesta has become the first choice for billing management and automation among a growing number of hosting providers around the world. Blesta features well-written, source-documented, object-oriented code that is nearly 100% open. Only three files are encoded — just enough for license protection. If you are a developer, you will love Blesta for its seamless integrations and near-100% open code base. The platform allows for integration with your favorite control panel, virtual servers, domain registry, as well as other licenses. 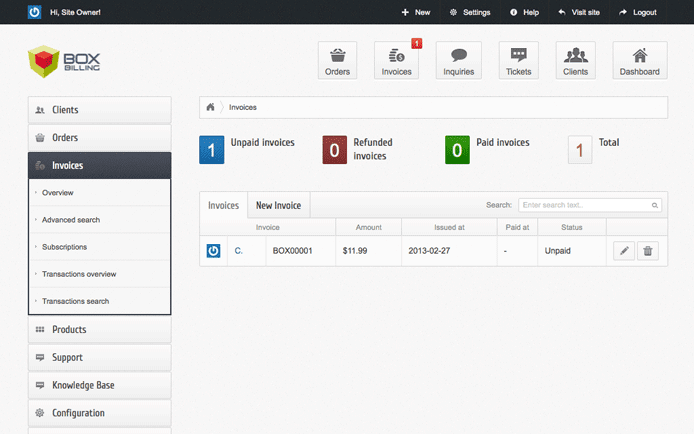 You can completely customize the interface, including your dashboard, billing overview, and client profile. Minimize, maximize, and configure widgets to your liking — and the team will love the clean, intuitive ticket system and helpful knowledgebase. BILLmanager is an SMB- to enterprise-grade billing platform of ISPsystem — the team behind many exceptional hosting software panels, including ISPmanager, VMmanager, and DCImanager. BILLmanager could become a real discovery for providers who are looking for a WHMCS or HostBill alternative because, on the functionality end of things, it lies somewhere between those two platforms, and the team aspires to the integration sophistication of WHMCS. One of the best things about BILLmanager is that it’s completely free for providers with less than 50 clients, without any feature or time limitations. BILLmanager represents the billing and automation solutions of the powerful panels by ISPsystem. With two plans, Base (for SMBs) and Corporate (for holding companies), BILLmanager’s bevy of features include automatic invoicing, billing, and service setup; domains, shared hosting, VPSs, cloud solutions (using VMware, Azure, or OpenStack integrations), SSL, and dedicated servers; and affiliate program management. The customizable dashboard gives you access to a wealth of reports and a ticket system for multiple departments. What’s more: The API is open and developers can access documentation for writing your own adapters using shell scripts or your choice of programming language. The billing and automation solution for hosting, cloud, colo, and VPN service providers, among others, HostBill is designed to help large-scale hosting and web companies manage business essentials (like getting paid). A powerful yet flexible solution, HostBill empowers business owners to manage every aspect of client billing. The eCommerce and automated billing features include 1-time or recurring billing, recurring invoices, SSL, and more than 90 payment gateways. The all-in-one client portal allows your customers to manage all of their services from a single touchpoint. 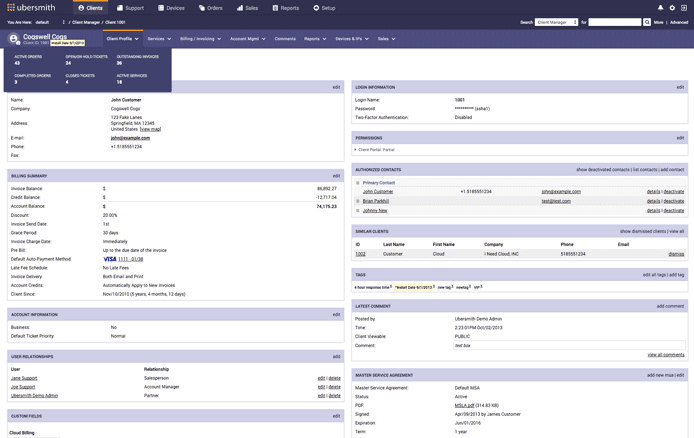 Ubersmith, an enterprise-level and all-in-one billing, infrastructure management (DCIM), and help desk ticketing software suite, is open-source and extensible. The fully documented RESTful API allows your developers to leverage the power of Ubersmith throughout your business. Ubersmith supports more than 180 customers in their missions to collectively serve more than two million clients. The platform supports both in-house and third-party integrations, including domain registrars, SSL providers, electronic payment systems, and merchant providers. 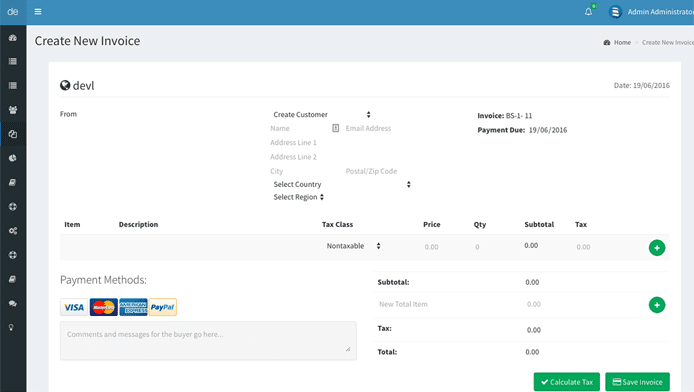 Additional eCommerce features include recurring invoice, payment automation, and configurable and customizable product catalogs — as well as more than 50 payment gateways. The industry’s leading billing and hosting automation solution for managing and scaling small- and medium-sized web hosting businesses is Odin Business Automation Standard (OBAS). The platform helps you maximize and decrease costs by automating all aspects of hosting business management. Equipped with the platform, you can offer a full range of hosting services, including email hosting, shared hosting, VPSs, hypervisor-based virtual machines, dedicated servers, domain registration, and SSL certificates. You can also build your reseller channels. OBAS is integrated with multiple payment gateways, domain registrars, service platforms, and other third-party systems. From order receipt to product provisioning to fully integrated, automatic billing, OBAS alleviates friction at every stage of the business cycle. Plus, Kayako helpdesk support features an exceptional customer experience, and fraud-proof CVV/AVS payment verification adds extra peace of mind. With self-hosted and SaaS versions stored on Clientexec servers, this management platform is extremely accommodating for hosting providers. It features more than 15 options for payment gateways, taxation customization, built-in live chat, and basic reporting on income, revenue growth, and incoming clients. Clientexec boasts the ability for users to “set (their) business to autopilot” and let CE handle the rest. The Clientexec REST API allows developers to hook into Clientexec and connect it to third-party applications. Whether you’re writing a plugin for an application or integrating internal software, the API can do the job for you. Take your pick from popular web panels: cPanel, ISPmanager, or Interworx. Clientexec integrates with all of your hosting business essentials. 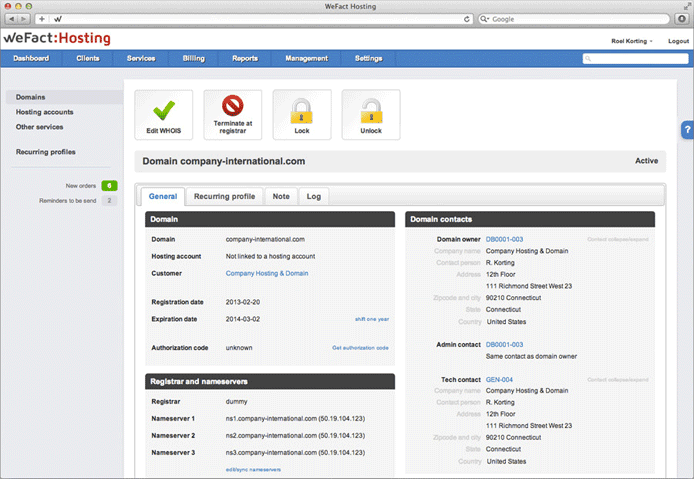 Boxbilling is built for sales — particularly catering to shared and reseller hosting, domain registry, software licensures, and downloadable product sales. The free version of the platform is quite limited; however, premium account holders benefit from flexible invoicing, powerful automation, and an integrated helpdesk with multiple supported departments. 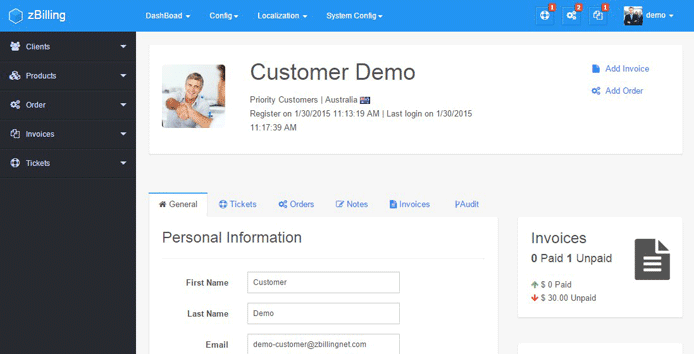 Boxbilling is a powerful but simple billing platform fit for developers and business owners. From easy product provisioning to optional payment gateways to the multi-language interface, Boxbilling touts quite a dynamic offering for web hosts. If you’re a developer, you can build your own add-ons quickly and easily, while strictly business folks can start selling in just as little time. The UK-based company behind the all-in-one billing system, WHSuite, has put together a unique offering, complete with multi-currency billing, smart deployment for adding and managing servers, and full support for domain registration. WHSuite touts every billing management essential from secure credit card storage to transaction logging. A very dev-friendly environment, WHSuite gives you total access to the system to create add-ons, manage Composer packages, and work with your choice of hosting control panel: cPanel, DirectAdmin, Plesk, or Virtualmin. There is also a developer manual to help you get started. Creating hosting accounts, setting up SSL security, accepting payments, and sending recurring invoices — it’s all made simple with WeFact Hosting, an easy-to-use billing and automation solution for hosting companies. Easy-to-manage WeFact Hosting allows for seamless integrations with more than 45 third-party applications. You’re free to customize your invoice PDFs, and online invoicing is a snap with PayPal, GiroPay, Sofort, and 2CO payment processing. WeFact Hosting can even register domains for you in real-time via InterNetworX, Epag, Key-Systems, and 20 other registrars. This exceptional platform features 45 third-party software integrations as well. An excellent billing system for OpenStack, Atomia is a complete hosting software platform you run on your own infrastructure. It has everything you need to run an efficient, successful hosting business your customers will love. Unlike the vast majority of hosting software platforms, Atomia is a centrally managed, clustered system. This is much easier to maintain and offers additional benefits like scalability and increased stability. To stay on the cutting edge and provide a truly modern hosting platform, Atomia is under constant development — with new releases rolling out around every six months (with patches in between). You’ll be able to easily and continually upgrade your platform and keep your customers happy. Atomia is easily installed on Windows servers, with the option of installing Atomia parts to Linux servers as well. With fully documented APIs for all platform components, Atomia was designed from the start to make it easy to make custom integrations. The latest progression on that front involves a project the team calls Atoms: third-party integrations for Atomia’s hosting and/or billing software. An Atom may be support for a specific payment gateway, domain registry, eCommerce platform, or site builder. Much like atoms in the physical world, Atomia Atoms will be the building blocks for extending and adding services to this robust automation environment. BillingServ is hosted in the Cloud in several datacenters around the world. Invoicing and payment options include credit and debit, bank transfer, check, and 10 payment gateways. This option is great for email marketing with CampaignMonitor, and includes sales forecasts and trend reporting. A complete online ordering and invoicing platform, BillingServ makes managing a hosting business simple. You can integrate with cPanel/WHM or Plesk, as well as your choice of domain registrar and SSL provider, and setting up packages is simple. BillingServ is actually a comprehensive online ordering and invoicing service — ensuring your business runs smoothly is BillingServ’s business. A Portuguese startup launched by Rafael Rocha, ZBilling boasts regular updates and a host of features to their billing, invoice, and support software. Their panel easily integrates with popular hosting control panels, including cPanel and Plesk, and the interface is completely responsive, thanks to the Bootstrap framework. 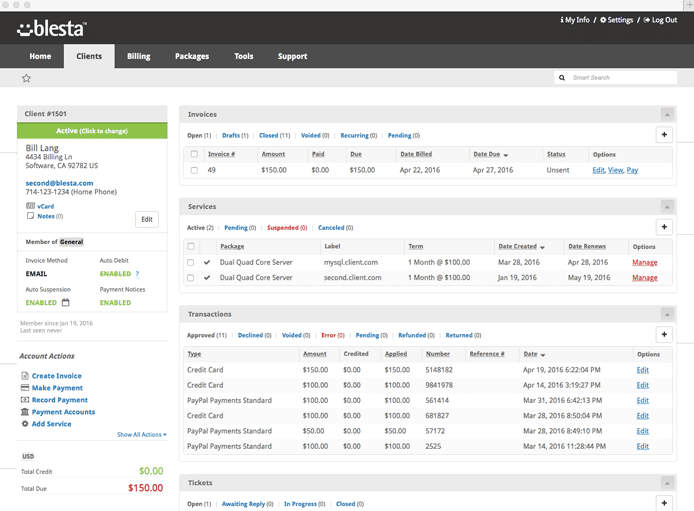 ZBilling NET boasts management tools for web hosting billing, SaaS applications, subscriptions, and licenses. Out of the box, ZBilling NET comes with nine languages: English, Dutch, French, German, Italian, Portuguese, Russian, Spanish, and Swedish, with options for custom PDF invoicing as well. 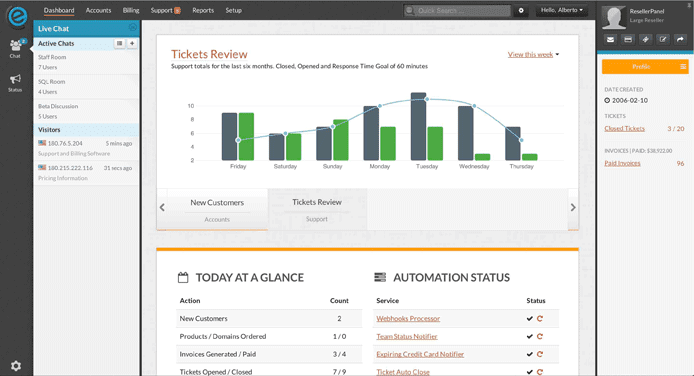 Create KB articles, manage comment threads, and oversee multiple departments in an advanced ticket system — all available in the back office. 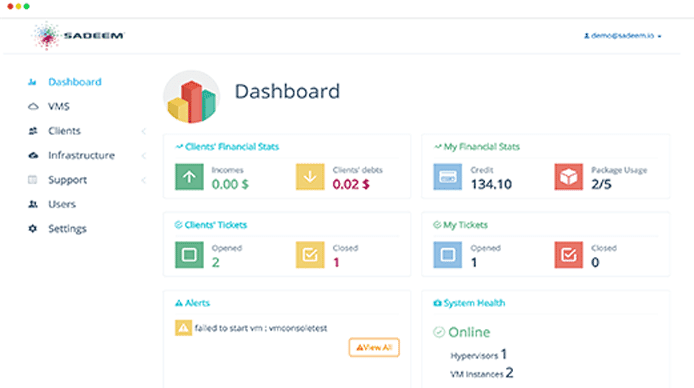 Virtkick is an all-in-one billing and VM provisioning platform. Once self-hosted, open-source software, the platform is now hosted in the Cloud, and there are only paid versions available. 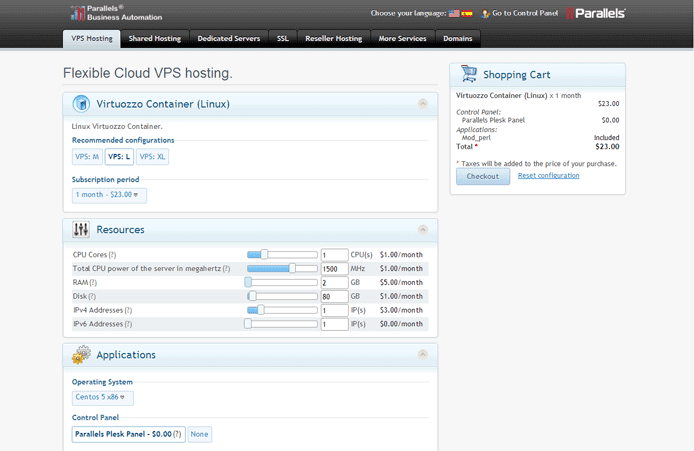 The Virtkick team touts this panel as the best for competing with VPS hosting giants. 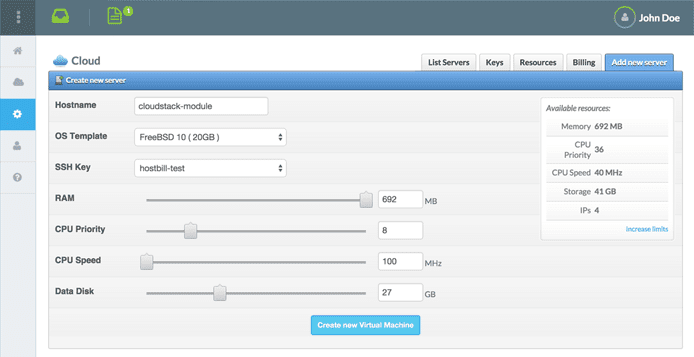 Nevertheless, the Virtkick Core code remains open-source, and this powerful panel is extremely easy to implement. Fully white-labelled, Virtkick enables datacenters, hosts, and enterprises alike to make the most of their hardware without unnecessary costs. The last of the startup platforms, Sadeem’s simple interface is aimed at helping cloud hosting companies and datacenters run smoothly. The panel is cloud-hosted, using datacenters and service providers around the world to ensure as much uptime as possible for your business. Sadeem’s built-in support system will help you support your customers. 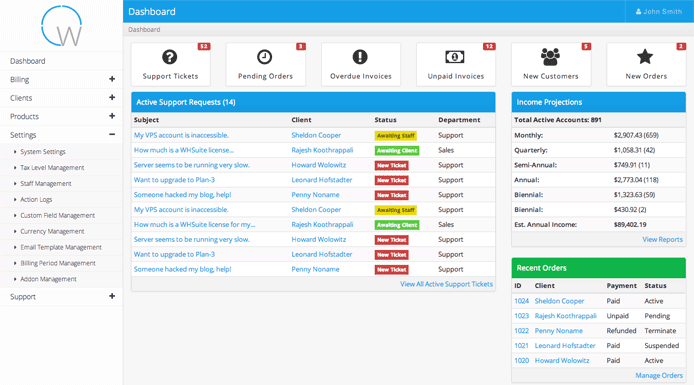 Complete with basic reporting and a ticket support system, Sadeem services feature a pay-as-you-sell model with hourly resource caps. Best of all: You can get started with Sadeem for free! Whether you’re dealing with small-scale shared server clients or enterprise-grade datacenters, a hosting business needs a control panel to facilitate mission-critical client management tasks. The companies and panels discussed above provide everything a web host or service provider needs to turn around awesome customer service while getting paid promptly. If you’re a web host shopping for billing software, I wish you luck in making your decision. If you’re a hosting customer whose hosting company is using one of the 15 panels above, you’re in good hands. Questions or Comments? Ask Alexandra! Ask a question and Alexandra will respond to you. We strive to provide the best advice on the net and we are here to help you in any way we can.